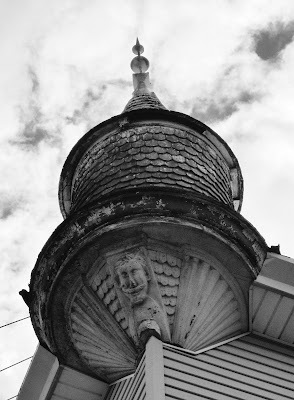 An unexpected turret leaning out from the corner of a frame house. 30th Avenue and 43rd Street, Astoria. When you're not at work, you can enjoy the midday pace of the nearby Fifth blocks, and catch up with one or two familiar faces who, despite the onslaught of fro-yo stores & nouveau-bars, are still hanging around. Connie, who I hadn't seen for ages ("it's the humidity, honey"), panhandling by the bank at 10th, looks good, and though missing her mother, gone a year ago, is enjoying the peace of her own apartment. The elderly sentinel outside Timboo's, convalescing from sickness, is always ready for a cheerful little Romney-trashing, and wry, gravel-voiced updates on the bar's reincarnation: the new sidewalk tables "look like Paris". Elderly ladies of the block carefully going about their business, on small errands that take them down the street and never up. And Keith, breaking a twenty in Neergaard. Those lilting religious pronouncements tinge any day with a hint of apocalyptic splendor. With the Olympics underway, I'm in full homesickness mode. Clearly I'll be playing song after song. About as perfect a store sign as you could wish for. At the Broadway N/Q station, in Astoria. 13th Avenue was brighter than New Utrecht, and rather more cheery. A greater number of women and children were out on the street. Mothers gathered in clusters chatting. Small boys walked home holding hands. The retail strip was a mix of old and new, with some shinier looking restaurants here and there, but also stores that seemed to have weathered forty or fifty years without the help of touch-up paint, sign repair, or even adjustment to a 718 number. Was it lassitude, or indifference? Or was a sign itself irrelevant, given that attracting newcomers was by no means important, or even desired? The stores, and their customers, were clearly long-term partners, and a sign hardly mattered. Certainly the K(&? )S Fisheries (UL4 6866), despite its faded appearance, was busy. Back at 55th, where 13th & New Utrecht meet, from very end of the station platform . There are still mysteries right at your doorstep. I got off the D train at 55th Street and walked north on New Utrecht Avenue to Fort Hamilton Parkway. 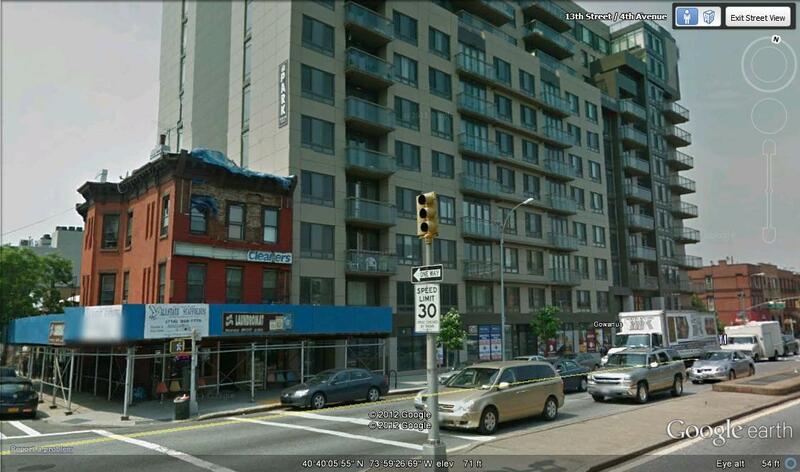 Right on 43rd Street, & two blocks over to 13th Avenue. Left to 39th, then back down on 13th to the 55th station. A loop. The air was heavy on New Utrecht - a full blanket of summer. The sight of sober hats and topcoats, of long-sleeved jersey knits & wigs, of high-necked frocks & thick stockings just made me hotter. Only the babies had the freedom of bare limbs. The stores under the elevated tracks were thick with dust, and I felt dust particles seeping through my own skin. At four p.m. the street was lightly travelled. The year? Undetermined. The New Utrecht N train stop, just down below the D on the Sea Beach Line, is nothing like its partner. The D offers roof-top views and a breeze that hints of ocean, while the N, belying the Sea Beach moniker here at least, rests in subterranean gloom, with tunnels at each end of the platform, and a warehouse fortress overlooking the tracks. The vaulted ceilings are a ruin of paint shards. A glorious temple of desolation. I mostly keep the contents of this blog confined to NYC, but was sent this pharmacy photograph today, and can't resist a good store, whatever city (or country) it's in. Christianshavn Apothek, in Copenhagen, has been in existence since 1707, though it's moved location in the city several times. The unicorn was favored by medieval apothecaries as a symbol of healing, and this particular one has been around since at least the 1780s. 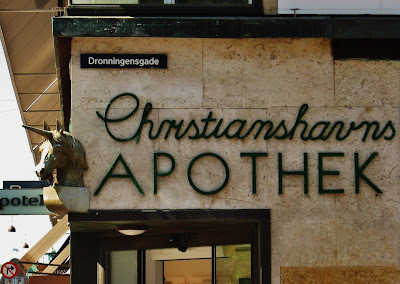 Christianshavn's has a long-standing maritime connection, at one time supplying ships' coffins, and today it still has a (real) shipping department, with medical supplies for sailors. (At Ruby's) ... the old, cluttered outdoor sign that advertised “ice cream, ice-cold beer and soda, corn dogs, and pizza” has been replaced by something more contemporary, but it is still there, hanging on an inside wall. Woodford says he’s not worried about pleasing the potentially picky and jaded big city pooches in Brooklyn. Last week Jeremiah Moss of Vanishing New York had a piece about a hoarder car, and this reminded me of the house on 13th St that I photographed last July. Later that summer, the house got a lot of attention on local blogs, and was a featured story on NBC news. After community protest and visits from the FDNY, the owner removed a lot of the stuff in the front yard, and the story faded away. I wondered about the house, but didn't check back. A typical case (for me) of taking the same old routes around the neighborhood. What a sad creature of habit I can be. I went back on Sunday & saw I saw that stuff had piled back up. Not at last year's level, but substantially enough. The cat-litter boxes had gone, but the carts were still around. The guy I saw a year ago was not outside. No-one was outside, really. It was a very hot day, and it must have been hot inside that closed-up house. The front door still looked pretty jammed-up. On Monday I decided to pay another quick visit. This time the owner was present, sitting in front of the steps in a fresh white shirt, peacefully engaged in that most suspicious & anti-social of activities. Reading a book. This is the hulking 500 Fourth apartment building, and here's another view of it, with the corner holdout building by its side. Why do I find these side-by-side views so unbearable? If you look closely, you might see a cage in front of the laundromat. Lindo and Linda are always brought outside in warm weather. They don't talk much beyond hello, but they're champion whistlers. If you whistle a phrase, Lindo or Linda will echo back with variant notes. In an age where whistling is rarely heard on the street any more (why did it disappear? ), this is a sweet thrill. Blondie's Deli/Grocery/Luncheonette is right by the entrance to the Fort Hamilton subway station. I stopped by the other day, and ended up sitting at the counter chatting to Bill, who used to own Snooky's Bar, on Seventh. Now retired, he lives right around the corner from the luncheonette. He had some good stories of an earlier Seventh, praised the beauty of simple food (a toasted onion roll with cream cheese, & plenty of salt) and was as welcoming a regular to a first time Blondie's diner as you could hope for. Thanks. From toy horses to real ones. This is a nice, quiet corner of Brooklyn to hang around. The small side streets harbor unexpected houses overgrown with vines, and for a moment you can almost inhabit an older, horse-drawn city. A friend of mine knows someone who rents around here, and her basement is used by the stable for extra storage. The smell of hay bales and cedar chips drifts up from below and fills the building with field and forest. Effetto Fashion sells, among its products, wholesale church and missy suits. Choi's, a little overboard in the barber pole department, gives a $14 Mans Cut, and other (undisclosed but widely known) mans services. A little farther west, the grandly named Lady Cezanne outlet sells toys & novelties below a bodywork parlor, which is itself below a plant laden terrace strung with Union Jack bunting. Perhaps left overfrom the Jubilee. A rather mysterious story of a charred skeleton nailed to a tree in an empty lot on Fourth Avenue! By (& I like the term) "an oddist". Apparently it's been there for months, and caused a certain amount of neighborhood tension. As I generally go down to Fourth on 10th or 11th, I never even saw it once. I went down to take a look tonight, but it had been removed. I had to content myself with this little horse. Spring had passed, & in summer (as in spring) a bear like this would more likely be fishing, or scooping honey from trees, than planning to tuck itself in for the season. Even a city bear would be foraging in trash cans or housebreaking. He might want a little shade though. This bear looked too old and overheated for any exertion. Just how long had he been stuck outside the florist's? When I Google-mapped Scott's Flowers there he was, with his partner, but I don't know when that was, & where the other bear ended up. It seemed cruel to have split up the pair - like an elderly husband and wife sent to separate quarters in the workhouse. I hope he finds a home.